This is the right place for this topic (national). Time to go to Ani! it's been far too long. Also to Van. Enough of you know who. Are you coming to Buenos Aires? Unless you mean our own princess house poet Ani!. In fact I have seen that ruined bridge along with the other ruins. Like, look but no touch! FOR centuries, a stone bridge spanning the emerald green waters of the Akhurian River connected the southern Caucasus to the Anatolian plains: a strategic pivot on the Silk Road, running through the ancient Armenian kingdom of Ani. 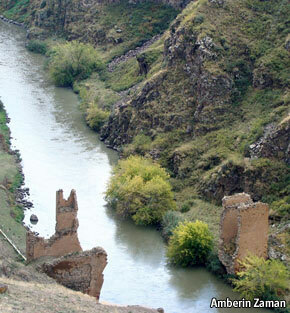 Today the bridge would have linked tiny, landlocked Armenia to Turkey. But war and natural disasters have reduced it to a pair of stubs—a sad commentary on the relations between the two states. This grim image prompted an Ankara-based think-tank, called Tepav, to devise a plan to rebuild the bridge and in so doing to reopen the long-sealed land border by stealth. “The idea is to promote reconciliation through cross-border tourism,” explains Tepav’s director, Guven Sak. Turkey’s doveish president, Abdullah Gul, has embraced the plan. The Armenian authorities and diaspora Armenians with deep pockets are also interested. If all went to plan, the bridge’s restoration would only be the start of a broader effort to repair hundreds of other Armenian architectural treasures scattered across Turkey…..
Dear Boghos, to not pour cold water on your enthusiasm, abate your thunder and distract us from the main topic. How many of those so called renovated monuments/1001 churches of Ani will have a cross on top, or even one Armenian inscription/letter left? Recently I read somewhere some of them argue about “why should there be a Christian Armenian church in furkey when there are no mosques in Armenia, except that ‘dilapidated and ruined’ mosque in Yerevan“. “dilapidated and ruined”? I have been there and I have seen it the way depicted in the picture below. I spoke with the groundskeeper who was meticulously watering and tending to the flower beds. (My companions did. I did not enter the mosque, lest I bare my stinky foot and my poly-hole-y socks), besides I have already seen the interior of mosques. 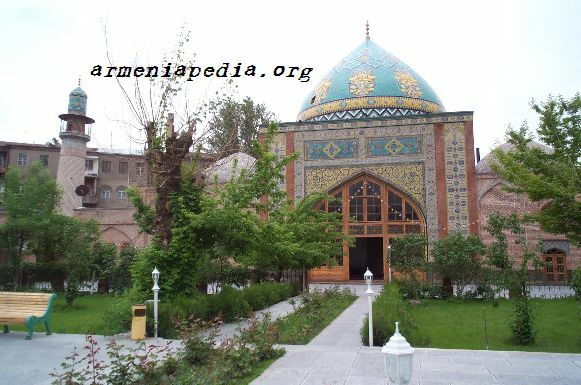 It is one of the most meticulously, respectfully and carefully kept sites in Yerevan, if not more than Ejmiatsin. The below is not the latest. Since then we have read that the date has been changed. Who knows? It may be totally canceled. Hakan Tekin, Turkey's Consul General in Los Angeles where around 1 million Armenian Americans live, said that Turkey's decision to open up the Akdamar Church on an island on Lake Van for a one-day worship caused a stir among Armenian American community in Los Angeles. "A large number of reservations have been made already," Tekin said. OK! All you American Armenians and Los Angelenes have you already bought your plane tickets? How many boxes of Kleenex have you bought? Why would any Armenian, be they American Armenians or Los Angelines want to go to that cursed land? How many of them have seen (among others) Ejmiatsin? Btw. In Ejmiatsin the prevailing language is Armenian. What is the prevailing language in “akdamar”? The only silver lining, if you will, is that of late they have been using the A word when only a short time ago they denied that there even is such a people . And note the reference to ANI and and "King Gagik“. Turkey will open up the Armenian church in the east of the country for a one-day worship on September 12 and Armenians living in California are looking forward to take part at the worship, a Turkish diplomat said. The 1,100-year-old Akdamar Church was opened in 2007 at a ceremony that hosted officials from Armenia and Turkey after it was restored by the Turkish government. The restoration costed some 1.7 million USD. "I hope our recent constructive policy toward Armenia yields reciprocal steps," he said. "If normalization process goes on its course, I believe that it would have significant effects on our relations with Armenian diaspora, especially with Armenians living in California who are the hard-liners," Tekin said. The Akdamar Church was constructed by architect bishop Manuel between 915 and 921 A.D. under the supervision of King Gagik I. Among the important pieces of Armenian architecture, the church draws attraction with its stone workmanship and the relieves on its walls. Earlier this March, Turkish government gave permission that a religious rite may take place once every year at the church upon a proposal by the Van Governorship and approval by the Turkish Minister of Culture and Tourism Ertuğrul Günay. The rite at the Akdamar Church will take place each year in the second week of September, officials said. Turkish officials believe it would boost religious tourism in the region. “Hakan Tekin, Turkey's Consul General in Los Angeles where around 1 million Armenian Americans live, said that Turkey's decision to open up the Akdamar Church on an island on Lake Van for a one-day worship caused a stir among Armenian American community in Los Angeles. Any self respecting Ter Voghormia and Ee Verin Yerousaghem singing Armenian to attend that CIRCUS, be they dressed in black or white (apricot) should be publicly ctiticized. Hi mutafoghlu- ateshoghlu and all other oghlu-ians. Akh Tamar,!!! Akh Toumanian!!! where are you? The California Courier Readers may recall that theTurkish government embarked on a worldwide publicity stunt in 2007 when it renovated and reopened as a museum the Armenian Holy Cross Church on Akhtamar Island in Lake Van. At the time, Turkey had goneto great lengths to lure to the opening ceremonies Armenians from around the world. Turkish officials did not conceal that their real purpose was to exploit this event for propaganda purposes. Even before the "Holy Cross Museum" was inaugurated, a Turkish Parliamentary delegation had arrived in Washington with a bulky photo album. Mehmet Dulger, then Chairman of the Parliament's Foreign Affairs Commission ,relayed the following message to Members of the U.S. Congress: "See, the Turks, whom you accuse of genocide, have renovated an Armenian Church with taxes collected from Turks. And those photos are the evidence." The photo album was distributed worldwide to all organizations advocating "Armenian genocide claims," according to the Turkish newspaper Zaman. Furthermore, Turkey invited to the opening of the "Holy Cross Museum" the culture ministers of all countries that had adopted or were considering to adopt resolutions recognizing the Armenian Genocide. In my column of March 22,2007, I had asked that the Turkish government designate Holy Cross, not as a museum, but a Church with a cross on its dome, and place it under the jurisdiction of the Armenian Patriarchate in Turkey. If not, I had urged Armenians to boycott the opening ceremonies, in order to avoid being used as tools for Turkey's campaign of genocide denial. In the end, the Turkish propaganda effort failed, as only a handful of Armenians from overseas traveled to Lake Van to attend the event. Now that Turkish officials have grudgingly allowed church services to be performed for one day only -- on Sept. 19, 2010 -- and a cross to be placed on the dome of this 10thCentury Church, they have embarked on Part II of their publicity campaign. All Turkish Embassies and Consulates worldwide have been instructed to invite large numbers of Armenians to this one-time church service in order to accomplish three objectives: 1) Earn millions of dollars in revenue from 5,000 tourists expected on Sept. 19 and another million visitors during the next year; 2)secure concessions from Armenians in return for Ankara's "magnanimous gesture"; and 3) score propaganda points with Europeans and Americans by presenting the image of a tolerant Turkish society. Hakan Tekin,Turkey's energetic Consul General in Los Angeles, told "Today's Zaman" that California's "one million Armenians" are looking forward to take part in the upcoming religious worship. To impress his bosses in Ankara, Tekin proudly announced that the "one-day church service" has caused a stir" among the Armenian community in Los Angeles -- no doubt the result of his hard work! He expressed the wish that Armenia would take "reciprocal steps" in return for Turkey's "constructive policy." Tekin also hoped that such a "normalization process" would have a significant impact on Turkey's relations with the Armenian Diaspora," especially with Armenians living in California who are hard-liners." In sparing no efforts to publicize the planned "one-day worship," the Turkish government has undertaken the following preparations: -- Special solar panels are being installed on Akhtamar Island, so that tourists can visit the Holy Cross Church by day and night. -- Since hotels are supposedly fully booked, plans are being made to house tourists in school dormitories and private homes in Van. -- Large video screens are to be placed outside the Church so the thousands of expected visitors can follow the services, as the building can only accommodate 50 worshipers. -- A 90-page guidebook will be published in the Armenian language. -- A 10-day Turkish-Armenian Cultural Festival is planned in Van. -- The border may be opened for a few days, so that tourists can directly travel from Armenia to Van, rather than spending a dozen hours to get there via Georgia, according to the President of Van Chamber of Commerce. I urge all Armenians to boycott this new propaganda ploy, unless Turkish officials take the following steps: Officially designate Holy Cross as a Church, not a museum, opening it for year-round worship services, rather than for one day only. Place the Church under the jurisdiction of the Armenian Patriarchate of Turkey, not the Ministry ofTourism. Allow Divine Liturgy to be celebrated regularly, after Holy Cross Church is properly consecrated in accordance with Armenian religious rites. Archbishop Aram Ateshian, Locum Tenens of the Armenian Patriarchate in Istanbul, is the appropriate religious official to present these demands to the Turkish authorities, without whose participation they would be unable to carry out the September 19 church services and propaganda campaign. It is doubtful, however, that such demands would be met by the Turkish government, given its traditional policy of callous disregard for the rights of the Armenian community in Turkey. Edited by Arpa, 01 July 2010 - 05:29 AM.